Southern California bluebird days! With lungs full of clean sea air and heads full of happy wanderlust, we entered frenetic but fun Los Angeles. The only tragedy to mar this voyage so far is the cussed unwillingness of even one measly California fish to take Jim’s delicious lures, offered lovingly and temptingly. We even have a herkin’ Coyote 6.0 lure, a gift from our B.C. friend Marty, who swears by it and who now (sensitively, thank you) types the phrase “I went f!$#ing” in his emails to spare us from having to endure reading the actual word. These California f!$# need some serious lure rehab or something. Perhaps a f!$#ing Swat Team. A lobster boat off Malibu perfectly named “Bugs” couldn’t sell us any lobster (regulations prohibit that), but they gave Jim some mackerel for bait. And, no, we did NOT have mackerel for supper. Karen calls to Jim, fishing doggedly in the dinghy until dark: Are you using the Coyote 6.0 now? We realized then that there must be a sudden dislike sweeping local fish populations, for hooks baited with mackerel. 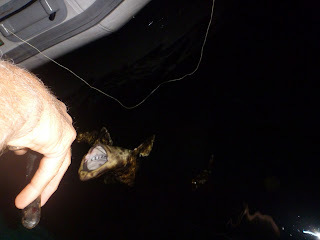 On the advice of a friend we let the lure sit on the bottom for a couple hours as we visited his boat. 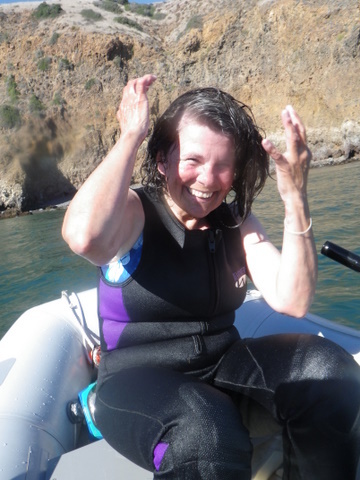 Upon returning in the dark, Karen says, Oh yeah, better reel in the line or we’ll catch a ton of kelp again. She grabs it. Dang, too late, it’s heavy. 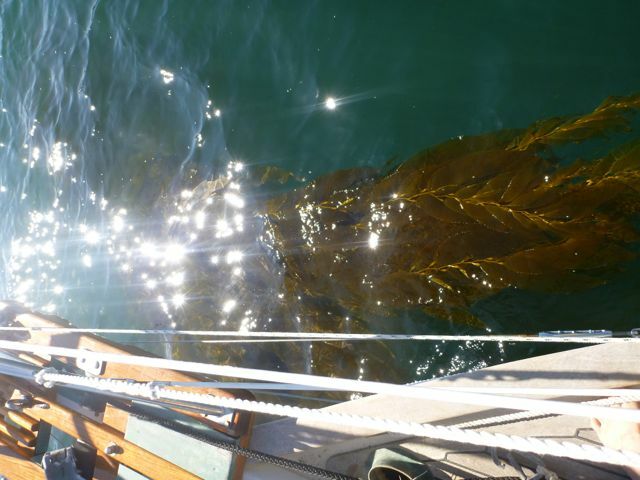 Wait a minute, this kelp is wiggling! HEY! EVERYBODY WAKE UP! We got a FISH! 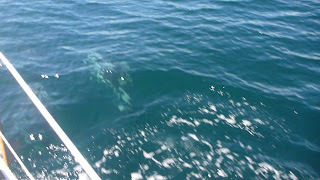 Jim reels it in, a big one, as Karen smacks her lips and says Oh boy, halibut here we come! 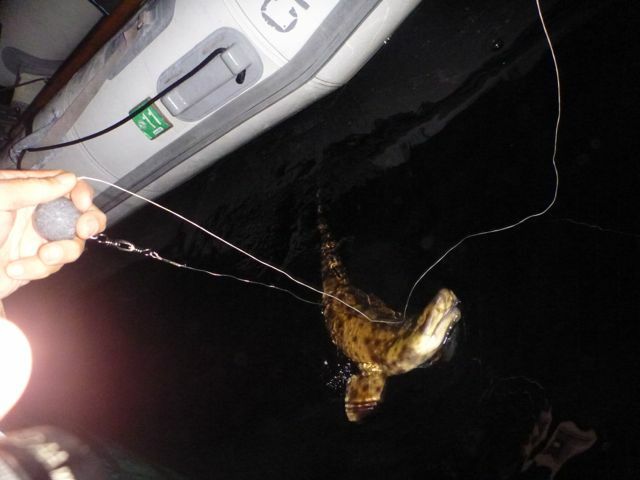 But it was a 3-foot leopard shark. Oh dear, how do you release one of these babies? Verrry carefully. 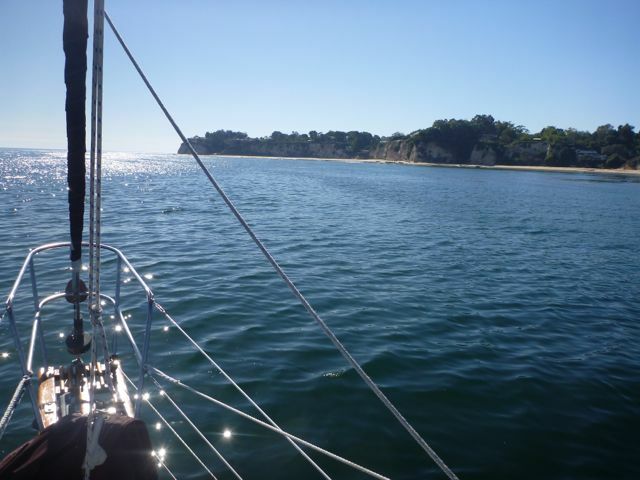 But I digress; back to when we left Monterey for the Channel Islands, a few weeks ago. 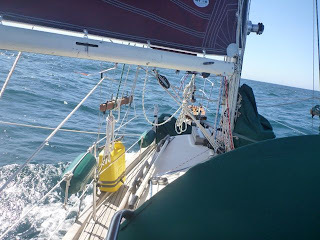 Passage from Monterey: We motor-sailed in light wind and no swell down the beautiful Big Sur coast that we’d just driven through—it was a sunny, clear day and Pacific white-sided dolphins played around the bow. We took some footage and will post when we can get it processed. 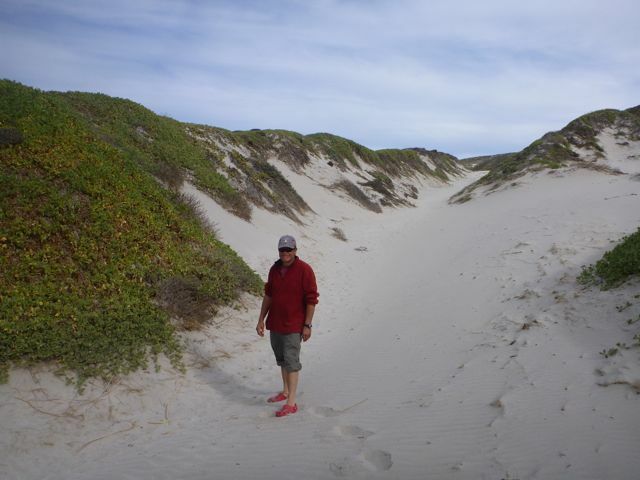 Karen saw a lone, large, black-footed albatross and a (possible) juvenile Laysan albatross—is that possible? It looked like one, it flew like one, but it was much smaller than the Laysans Karen has seen in the Aleutians. Anyway, from 5 miles out at sea we raised a glass at sunset as we passed Nepenthe, where we'd dined and one of the finest restaurants anywhere. Sunset was clear; perfect conditions for seeing the elusive Green Flash. 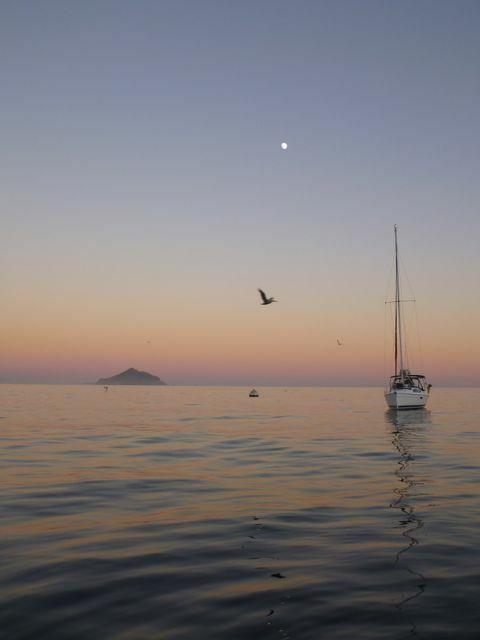 We watched the sun go down in a calm sea with gorgeous colors. On rare occasions about half a second after it sets, there’s supposed to be, if you’re extremely lucky, a vivid flash of green right at the spot where the sun disappears. We stared at the blazing orb… get ready… there it goes… OMIGOD! I saw it! Did you SEE that? 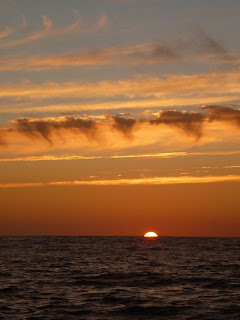 We high-fived, because although it wasn’t a big Green Flash (more of a Green Speck, really) it was unmistakably green. What a great portent for a 200-mile passage that turned out to be delightful. 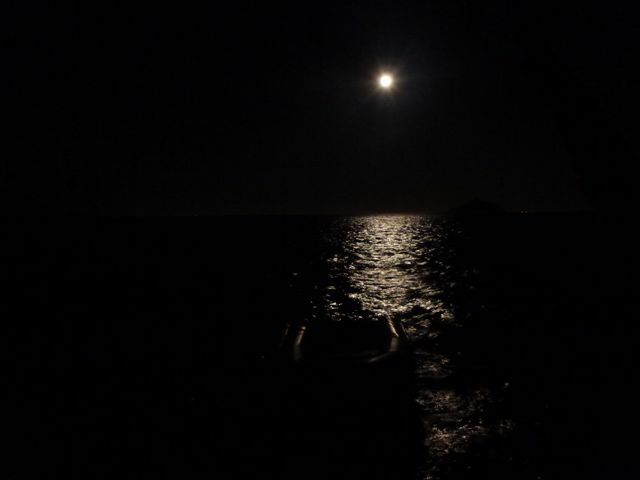 Into a perfect starry night we went, and by 0345 were sailing under main and genoa in a gentle northwesterly. In that 24 hour period we made 125 miles. 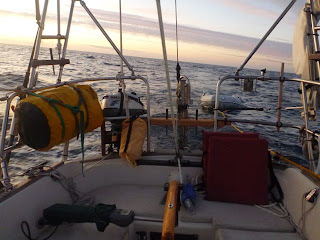 We’d decided to leave a day before the better winds arrived, because we wanted to make it all the way to the Channel Islands before the next storm system rolled in. This meant some motoring early on, but ensured that we had decent weather at the end. Here's a happy Jim, in need of either a barber or a double reef in his hair. And that beard? Hemingway-esque, eh? 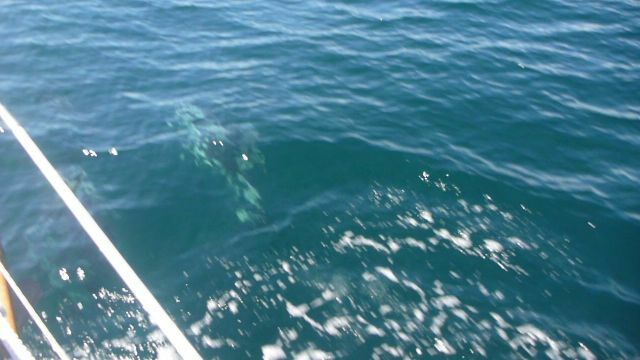 A Gam at Sea: Karen spotted a ship coming right at us. We were on a collision course, so she called them. The R/V Raven had been angling over our way to have a look at us. Its captain just wanted to talk. So there we were, yakking happily over the radio about shipboard research out of Dutch Harbor (Karen asked them if they knew the ship she used to sail on, the Tiglax, but they didn’t) and about the weather, and all sorts of subjects. The captain fishes the boat in Alaska when he's not on contract to NOAA doing fisheries research. 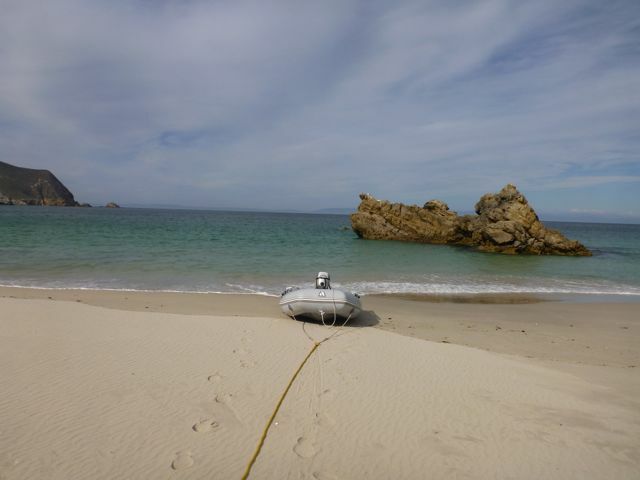 We talked for 20 minutes, the big research ship and the little sailboat, having a nice sailor’s gam out at sea. We asked where they were going, and the captain said after the next trawl they’d duck in to anchor under the lee of Point Conception. 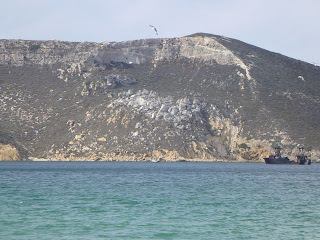 We told them we were heading for Cuyler Harbor on San Miguel Island, and the captain said in all the years he’d been in this area he’d never been in there, because he thought it was too rocky to navigate. After we discussed the entrance to the harbor with him and he had a good look at his chart, we bid them goodbye and sailed on. 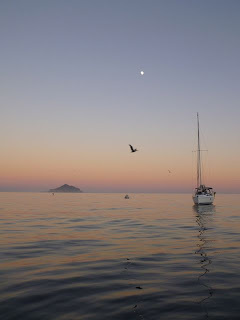 Landfall: The passage went so well that we arrived early at the crossing point between our course and the Santa Barbara Channel shipping lanes off Point Conception, which meant a we’d have night arrival at San Miguel, the wildest, rockiest and most northwesterly of the Channel Islands. So here’s another unique challenge: slowing the boat down in a rising wind so as to not arrive off a rock-strewn harbor entrance in darkness. It’s not as easy as you might think. 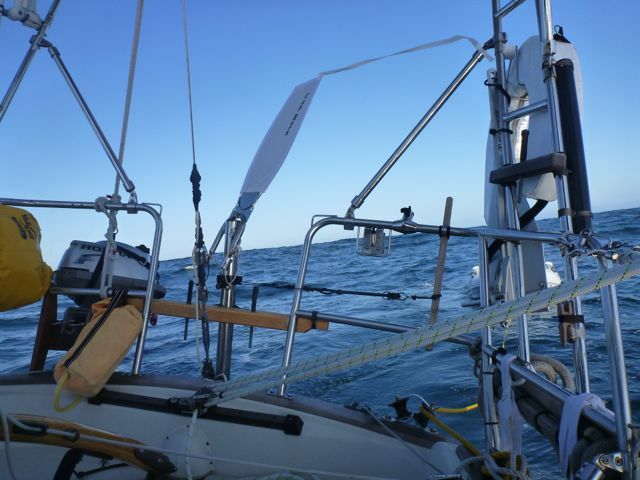 We kept reducing sail until we had nothing but a tiny scrap of genoa out (there’s that meaty phrase again) and we were still doing 3 ½ knots when we needed to be doing 2. Winds were 15-20 and forecast to increase, and Sockdolager did not want to slow down! The seas were getting up, but we did some zig-zagging to increase the miles sailed and stretch out the hours until dawn. It worked. The weather was going to get windier soon, so we dinghied ashore (our first surf landing) and went for a short hike before going back to the boat to rest and plan a longer hike for the next day. 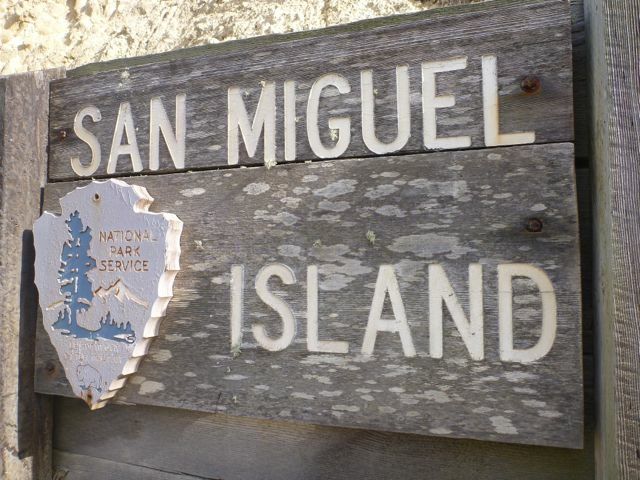 The northern Channel Islands are mostly National Park lands. 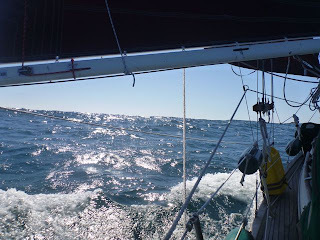 But the winds rose to gale force and never allowed us to get ashore again for the entire 4 days we were there. Williwaws roared down from the mountain ridge and blasted the boat at night, with wind gusts going from almost calm to 40 in a few seconds. The swell curved into the harbor and we rolled a lot until we put out our flopper-stopper (a gift from Captain Peter Frost), which dampened the motion. Big surf put an end to shore excursions. But Cuyler was one of the most gorgeous, wild harbors we’ve seen since the Queen Charlotte Islands. Amazing to have such a thing within 80 miles of Los Angeles. Here is a public domain photo closer-up. These are smaller than the ones we saw, but we didn't want to get too close. The largest males have a proboscis that looks like a short elephant's trunk. 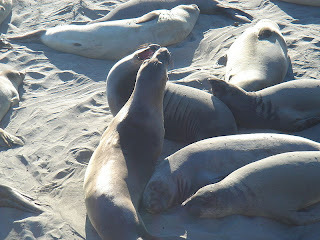 We stayed a couple hundred yards away in the dinghy so as not to disturb the herd sunning on the beach, but several large males began to get up, stare and belch in our direction. We then realized that the low burble of our tiny 2 horsepower outboard sounded EXACTLY like a six thousand pound elephant seal belching a challenge from out in the water. Our inflatable dinghy being rather round, large and gray did not correct the impression we were giving them, either. 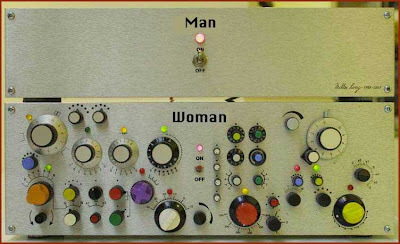 Uh-oh… What was our outboard saying to them? Outboard: Hey! Fatso! Whatcha doin? You call that a belch? On the way back to the boat we stopped to say hi to the Raven’s crew, and they gave us some fish! O! Heaven! We gorged on fish and chips for supper. A small fishing boat came in, full of divers with hookah air hoses, and after a few dives they approached us and said YOU WANT SOME SEA URCHINS? Whaaaa? 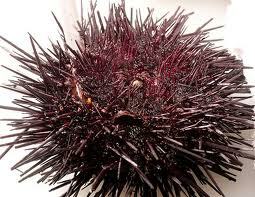 Karen replied, Um, we don’t know how to cook them, but then one of the divers shouted YOU DON’T; YOU EAT THEM RAW. THESE ARE A TREAT IN JAPAN. HERE, TAKE ONE! And he cracked open the bottom of a big one and handed it over, a ten-inch pincushion dripping goo. Um, THANKS, we said as they motored off. Peering into the gooey black and red slime inside the urchin, we spied the yellow roe, which is what you’re supposed to spoon out and eat raw. Karen looked at Jim. Uh-unh. I don’t think so, he grimaced. You’re on your own. Very well then, she said, and spooned out some roe. It tasted like… raw clams! I can see why otters love these things, she said. But the quivering Technicolor slime got the better of her appetite, so we slipped the bifurcated urchin back into the sea for other creatures to munch on. 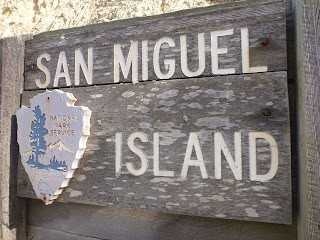 Leaving San Miguel, we had a delightful 22-mile sail to Santa Rosa Island’s Becher Bay, an indent in its eastern side, but just as we rounded the corner into the channel nicknamed “Windy Lane,” the wind really piped up—to almost 40 knots! 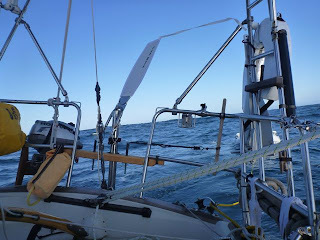 The mainsail was already double-reefed, and with the staysail and a tiny scrap of genoa up forward, we sailed to windward at 4 ½ knots to stay in another rolly anchorage. Jeez, said Karen, that was a lotta wind. I want to complain to someone about this, said Jim. Maybe we should compose a letter then, said Karen. 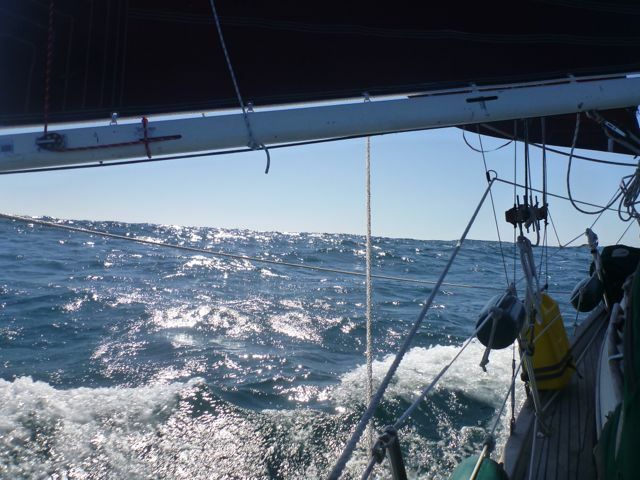 It has come to our attention that excessive winds of late have made for very rolly anchorages, and today’s 35-40 knots just as we were trying to sail into harbor and drop anchor was rather like gilding the weather lily, don’t you think? In the future, we would appreciate it if you would refrain from doing that. Next morning we left, and in utterly calm water were delighted by the sight of several species interacting off the SW corner of Santa Cruz Island: sea lions, white-sided dolphins, pelicans, gulls, and one or two other bird species. 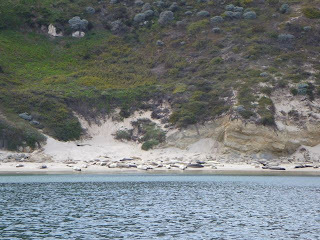 The birds circled and landed in among the mixed group of sea lions and dolphins, and we watched as the sea lions executed perfect dolphin-dives right after the dolphins did. They were so good at imitating dolphins that we did double-takes. In other parts of the West Coast, sea lions don’t do this, but here in the Channel Islands, where they evidently play with or at least observe dolphins, they dive like them, even when the dolphins aren’t around. Here's a view of Anacapa Island from the top of the hill. Sunsets are spectacular around here. This is a view to the east from our cockpit as the sun set in the west. 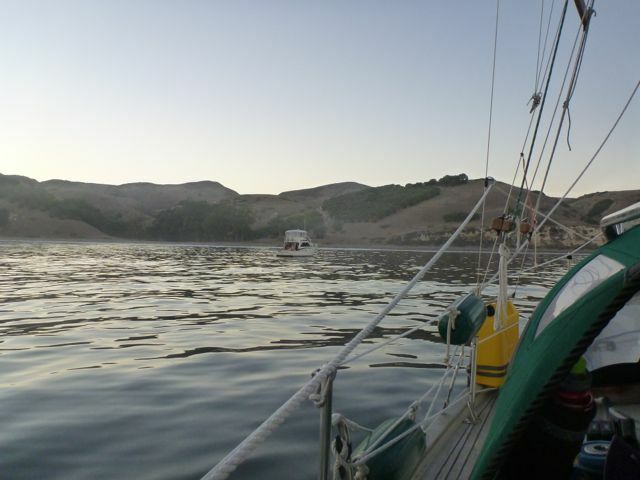 That's Anacapa Island in the background. 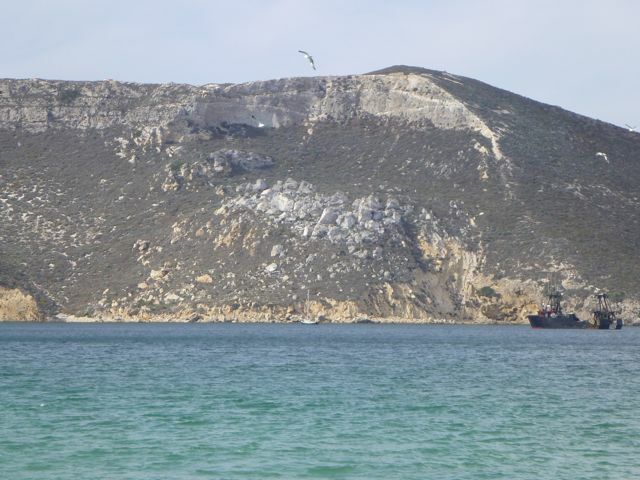 It's one of the most important habitats for endangered nesting brown pelicans in the world. We enjoyed swimming and snorkeling in the cold clear water, and Karen had a much-needed shampoo. 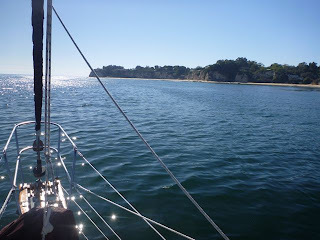 Hangin' with the stars at Malibu: Our new Smuggler’s Cove friend Jim Morris, a solo sailor aboard the 46-foot ketch Silver Fog, had told us of a great anchorage at Malibu, called Paradise Cove, so we decided to try it. As we sailed in, gawking at the mansions of movie stars on the bluffs overlooking the cove, we saw Silver Fog waiting there. 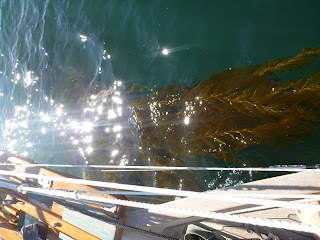 Anchoring was easy, but there was kelp all around. In the café, where if you walk in wearing a decent pair of sunglasses everyone looks quickly to see if you’re someone famous (Karen did this and enjoyed it immensely), we were seated near an actress who’d been in the movie Charlie’s Angels, who looked just like a normal person with no makeup. 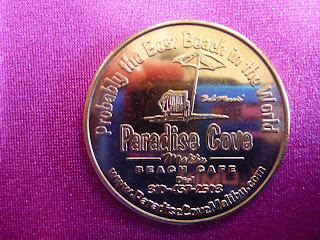 Our young waitress was rather inattentive, and Jim Morris whispered, “I think I’ll try something.” He turned to her and casually said, “I’m Jim Morris.” It was like she’d been cattle-prodded. She snapped to attention and was the picture of excellent service after that. Suddenly, a large smiling man appeared at our table. Jim Morris blanched under his tan, nearly blurted “DAD!” but held himself in check and explained who he was (just a sailor from that boat out there.) 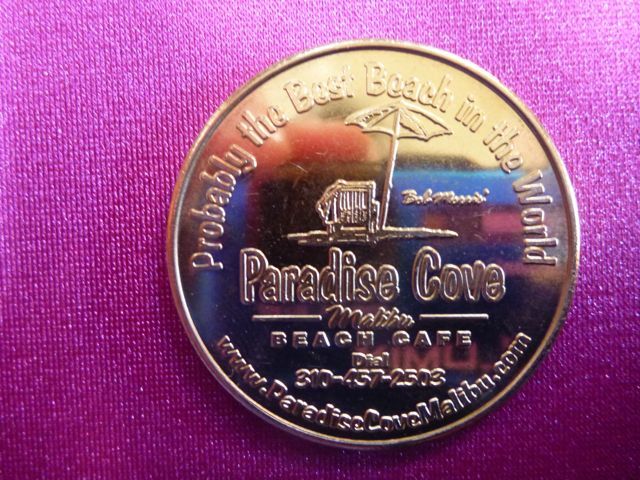 Bob Morris was kind and funny, and gave us each a genuine Paradise Cove Beach Café Golden Sovereign coin! Jim Heumann: Wow, is this legal tender? Bob: Well, a guy broke a tooth on it. Karen: I see it’s made of 100% unobtanium. Bob: That’s right. Not many people notice that. Life at Marina del Rey: Our friend Bill Mooz, Grand Canyon River Guide Extraordinaire, picked us up shortly after we arrived, brought us to his home in Pacific Palisades, and pointed us straight at the showers (each to our own tiled and marbled bathroom). Then he took us to dinner at a little Italian café, where he regaled us with stories of people he’s met and places he’s been. He and Jim talked River Guide talk. We all laughed long, often, and loud. Then we stayed at his garden-secluded house and slept in a ROUND bed. With a mirror overhead. Yep. That’s enough of those details. 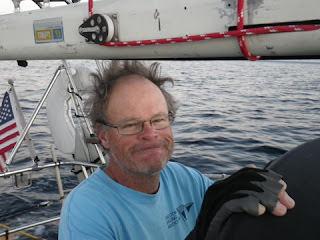 But as host to a couple of tired and dirty cruising sailors, Bill gets our nomination for an Academy Award, a Grammy and a Pulitzer. 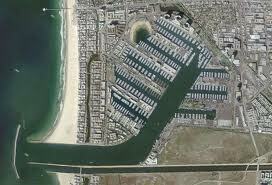 This is Marina del Rey. It's beyond huge. Karen’s writer-friend Bill Neill, who lives nearby and is working on a maritime thriller called Rogues, roller-bladed over for a visit and we all spent the afternoon and evening talking about writing (huge fun for Karen), and what it’s like to work in television. He’s been a writer and Executive Producer for a number of popular shows, including Unsolved Mysteries, and has written and edited more than 400 hours of TV script, so his stories were fascinating and fun to hear. We can’t reveal anything about his upcoming book except to say that Sockdolager will be in it--Woot! A character sketchy: It’s 9:30 on a Sunday morning in Marina del Rey, largest marina in the world. A twin-hulled, 40-foot cigarette boat with obscenely loud engines starts somewhere across the marina’s fleet of 8,000 boats. We hear a VROOM! VROOM! Ba-rumbarumba-cough-cough-VA-ROOOMMM! Ba-rumbarumba-cough-cough, etc. These engines are so insanely loud that you can easily hear them five miles away at sea. Anyway, the guy goes rumbling past our dock, so loud that of course everyone has to stop what they’re doing, say “What the…?” and go look, which is exactly what the lone occupant, a shirtless, deeply tanned middle-aged male, seems to expect. An octopus, a squeeze and the National Enquirer: We got acquainted with a nice couple on a sailboat docked next to us, and learned they’d sailed to French Polynesia on a 28-footer several decades ago “before GPS, I had to learn celestial on the way!” And therein lies a tale… some friends came to visit them in the tropics and brought a copy (of all things) of the National Enquirer, which they normally never bothered to read, but since they were news-starved in the boonies, Lydia devoured it cover to cover, noting with interest an article on performing the Heimlich maneuver in case someone chokes. 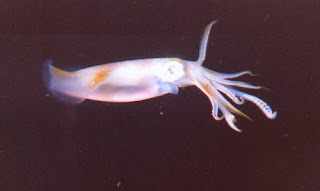 The NEXT DAY, and I swear we are not making this up, her husband, while eating calamari, choked on a tiny piece of octopus tentacle (“you know how it tapers, right, well it tapered perfectly down my gullet and closed off my breathing.” Lydia thought, hey, didn’t I read about this in the National Enquirer yesterday? She spun him around did the Heimlich maneuver, and Pop! Out came the little tentacle! “I saved his life!” she said. Evidently word got back to the National Enquirer, and they featured a full page story on the Feldmans under a screaming red headline: “Couple Saved by National Enquirer Article!” Closure on a story doesn’t get any better than this. And finally... We walked a mile or so to a ship's chandlery and Karen went to the front desk to ask if they had print-on-demand nautical charts of French Polynesia. They didn't and steered her to someplace beyond walking distance. Another customer overheard her and said, "We have charts all the way to New Zealand, would you be interested?" 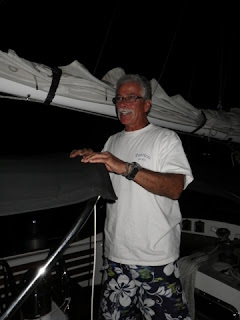 The next day we met Tim and Debbie, two very experienced cruising sailors, at Starbucks where we bought all of their charts and most of their cruising guides! Karen remarked to Tim, "This really was serendipitous!" To which he replied, "It'll be this way for the rest of your life!" Cheers, Harriette! If it were any more fun it might not be legal. 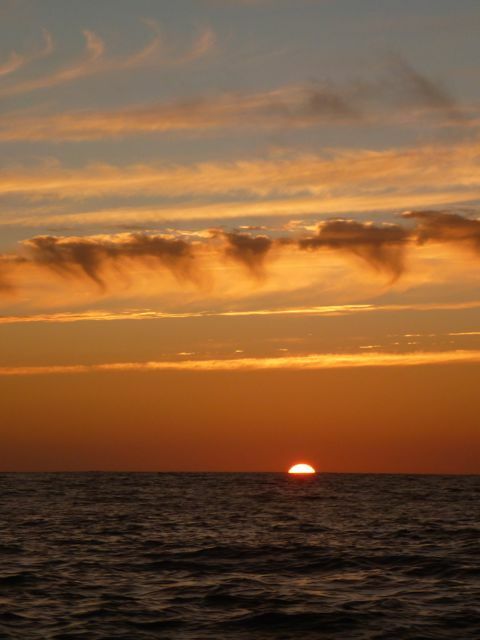 The "secret" to seeing the green flash is to close your eyes, peek from behind your hand/between your fingers and NOT look at the sun as it sets. Then your eyes aren't blasted by full sun, and as that last sliver of light slips below the horizon, you can look right at it, and once we learned that trick, we saw the green flash every night sailing in the Carribean. Love the whale pictures too!!! Oh yeah, and in case you hadn't heard, we had almost a foot of snow today ;-). Ski season!! !